JAK Health Consulting is a private dietetic practice specialising in weight management. Katie from JAK came to Metz Creative looking for a creative design solution for a handbook that she wanted to provide to her clients. Our inspiration for the style of the handbook was to create a fresh, rustic, healthy active theme throughout the design, this is highlighted by the full page photography we have used on each page that combines well with the organic content of the brochure design. We wanted to make sure the overall graphic design style of this brochure would appeal to the target audience which are females aged 25-45 years. With about 70% being in the younger age bracket of 25-35 years for this particular diet. The content includes food diaries for her clients to fill out during the diet plan, we designed the diary pages to look modern & eye catching by using the Jak Health brand colours along with some modern fonts and changed the orientation to suit the brochure. The flow of the content & imagery in the brochure design was carefully considered so that each page featured a hero image to compliment the text on each double page spread. The rustic food photography was planned for each page so the image directly relates to the content. The fonts we used are modern & work well with the Jak Health branding, the brand colours are used through to highlight headings and really make the colour pop on each page! Our creative team were inspired by the style of Jamie Oliver & Lola Berry cook books, which also look foodie, organic, healthy and delicious! 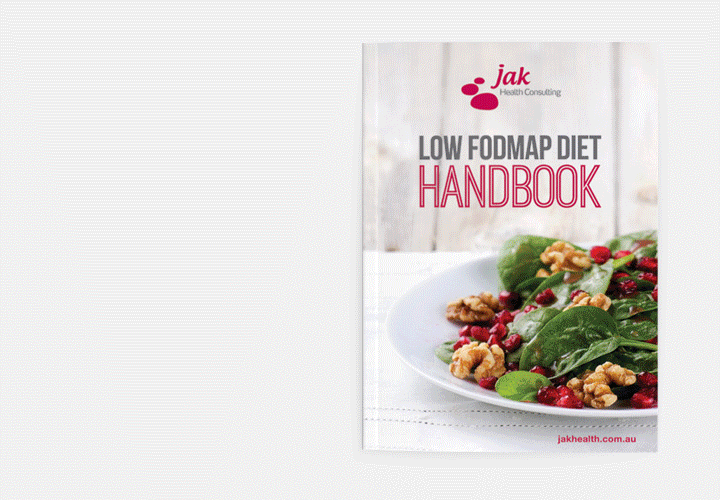 The new Diet handbook is designed to be inspiring and motivating to the clients who are excited to be starting this low fodmap diet and will be happy to not only carry around a nicely designed and styled handbook but too also read all the handy hints inside.